Fully Independent Suspension with Oil Filled Shocks and Tuned Springs gives you superior handling and control! Sealed Electronics box lets you take your IGNITER outside to explore all types of terrain. 2.4Ghz Digital Systems let you race with endless friends - without the worry of frequencies or channels! Includes 1100mah 7.2V NiMH battery and charger. This is a limited edition version of the popular FWD drive, M-chassis M-05 platform. The plastic parts are molded in gold color, specifically the main chassis and damper stays for a unique look when combined with the standard black suspension parts. To finish off the special edition, extra aluminum parts are included which also feature a champagne gold color for added value and increased performance. The early part of the 1987 F1 season saw a brightly colored yellow Lotus driven by the first ever Japanese F1 driver Satoru Nakajima and young Brazilian, Ayrton Senna. With Honda helping Williams claim the 1986 championship, Lotus opted for Honda's powerful RA166-E turbocharged V6 engine for the 99T. The 99T featured an electronic Active Suspension system which allowed both drivers to continually adjust the car's settings to compensate for the changing conditions of the track, speed, steering, and the weight of the car. Ayrton Senna went on to take victories at the Monaco and Detroit GPs for Lotus and finished the season in 4th position i the driver's standings. limited edition 1:10 R/C assembly kit model of the Lotus 99T. Length: 405mm, Width: 200mm, Height: 106mm. The proven direct-drive 2WD F103 chassis mimics the features of the Lotus 99T. The Lotus 99T body is accurately reproduced with durable polycarbonate. Lightweight semi-double deck chassis features 1.5mm upper and 2.5mm lower FRP decks. Sticker sheet to depict the car's livery and separately-molded parts for the front/rear wings and a driver helmet included. Paint for the body 2-channel R/C system, Electric Speed Control, battery pack & charger are sold separately but required. Comes with unpainted Clear Body. Team Weider is a Super GT team that drove the impressive Honda HSV-010 for the 2010 season. At the season's opening race, the Team Weider's HSV-010 sensationally won pole position immediately stating its intentions for the championship. At the 2nd round Okayama GT 300km race, the HSV-010 won pole position again and went on to win the race. Other strong performances including a 3rd place finish at the 4th Round Sepang, a 2nd place finish at the 5th Round Sugo set up an exciting championship deciding fnal 8th Round at Motegi. After winning pole position for a third time, the race saw the Team Weider HSV-010 battle hard with the Lexus Team Petronas Tom's machine for the win. Although narrowly missing out on the victory, the 2nd place finish was enough for the team to be crowned the 2010 Super GT 500 Class champions. Item 42102 TRF Special Damper Set (Hard Black Coating) 4pcs. 1:10 scale R/C assembly model. The Unpainted polycarbonate body accurately captures the sleek form of the Honda Raybrig HSV-010. Medium-narrow racing slick tires and medium-narrow 6-spoke wheels (offset +2) included. Side mirrors and rear wing are accurately reproduced with separately molded ABS parts. 2-belt driven TA05 ver.II chassis offers superior control, handling, and easier maintenance. Sticker sheet and masking seals included. Install separately available Tamiya LED Light Unit-01 (TLU-01) for enhanced realism. 2-channel R/C system, battery pack & charger are sold separately but required. Comes with the Unpainted Clear Lexan Weider HSV-010 Body. The latest generation front-motor front-wheel drive FF series chassis is the FF-04 EVO Chassis kit, which builds on the carbon fiber double-deck concept of the FF-03 EVO Chassis and takes it to a new level with a range of upgraded and newly-designed parts. The chassis offers superior cornering, and employs a double deck layout with 2.5mm thick lower and 2.0mm thick upper carbon fiber decks. Suspension arms use the same design as those on the TRF418 touring car chassis, and power is transmitted via an oil-filled gear differential unit housed in the XV-01 chassis design gearbox. The result is reduced track surface contact during cornering, and even sharper handling. *Note: Radio gear, battery, charger and ESC (electronic speed control) are required and available separately. This is a "BLACK EDITION" of the TRF102 Formula One Chassis kit. All the aluminum parts are anodized in black, whereas the original kit was anodized in the world-famous Tamiya Blue. The TRF102 is the second-generation high-performance Formula One chassis designed by Tamiya's elite designers. This iteration is a revolution! The kit features a number of changes to provide superior performance especially with rubber tire applications and outdoor track use. Both the front and rear of the car have been redesigned to fully utilize the flexibility of the chassis, with the effect of excellent road holding and response. The New T-Bar design provides a progressive roll damping effect superior to that offered by the spring-actuated side links on the TRF101. The roll point ball has been placed in as low a position as possible, in order to maximize damping effect. 2 thicknesses of T-bar (1.5mm and 1.8mm) are included. The brand-new pitch axle gives vastly improved, independent pitch damping, letting the chassis deal much more smoothly with undulating surfaces. Servo mount screws are attached closer together on the lower deck. This, in combination with the floating battery mount, allows greater expression of lower deck flexibility, giving the feeling of greater stroke at the front of the car. A new servo stiffener keeps the servo firmly in place. Slits are cut into the lower deck to further enhance its flexibility. The roll damper has been moved closer to the lower deck, giving a more compact rear and contributing to the chassis' low center of gravity. The popular FF-03 chassis has been upgraded with a variety of race-spec tune-up parts to create the "R" version. This version of the chassis represents excellent value as it features newly designed parts including a carbon battery plate and a redesigned gear case which houses an oil filled gear differential unit to further enhance performance. except all the aluminum parts are now anodized in black instead of blue. Pivot Ball Link Rear Suspension (PBLR) like the one found on the RM-01 chassis. enables more precise adjustments of the chassis' pitch and roll characteristics. 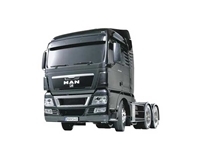 This is a 1:14 R/C assembly model kit of the MAN TGX 26.540 6x4 XLX tractor truck. Length: 526mm, Width: 193, Height: 301mm Wheelbase: 237+103mm. Transmitter, Battery pack and Charger separately available. Battery: 7.2 V Stick Type NiMH or Lipo Battery.